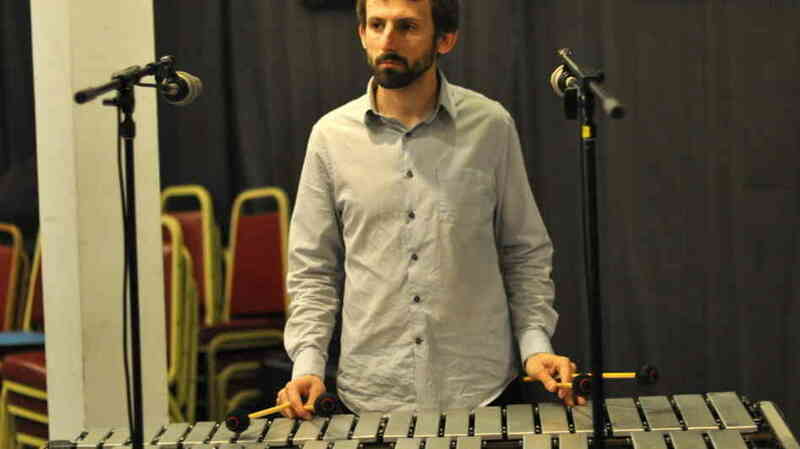 The Fall 2013 Concert Series at Firehouse 12 in New Haven continues with the return appearance of vibraphonist and composer Chris Dingman. It's his 3rd time in the performance venue and 2nd as a leader. In October of 2010, he performed the music that appeared on his 2011 debut CD, "Waking Dreams", and returned 14 months later as a member of drummer Harris Eisenstadt's Canada Day. This Friday (11/22), Dingman, a native of California who came East to study at Wesleyan University, is the leader of a impressive sextet that will play music from "The Subliminal and the Sublime" - it's a brand-new suite commissioned by Chamber Music America. The group selected to play the music includes 2 people who appeared with the vibraphonist on the October 2010 gig, Loren Stillman (saxophones) and the wonderful young Cuban-born pianist Fabian Almazan plus Linda Oh (bass), Ryan Ferreira (guitar) and Justin Brown (drums). Chris Dingman et al will play 2 sets - 8:30 and 10 p.m. - for ticket information, go to firehouse12.com or call 203-785-0468. To learn more about this fine musician, go to www.chrisdingman.com. The Side Door Cafe, 85 Lyme Street in Old Lyme, has become quite a hot spot for creative music. Located in the historic Old Lyme Inn, new owners Ken and Chris Kitchings have made a commitment to present live music, at least, every weekend and have done so since May of this year (opening night featured the legendary George Wein...yes, he of the Newport Jazz Festival - he's also an accomplished jazz pianist). This week, the Cafe welcomes guitarist Duke Robillard and Trio on Thursday (11/21), the Joyce DiCamillo Trio on Friday, and the Rene McLean Sextet featuring Gary Bartz on Saturday. 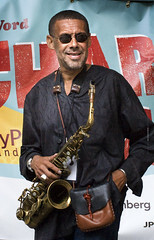 McLean (pictured left), the son of jazz saxophonist and educator Jackie McLean (who, along with his wife Dollie, founded the Artist Collective in Hartford), has concentrated more on being an educator/musician than a recording artist. He continues his father's work in Hartford while also teaching around the world.. Doors open each evening at 7:30 p.m. with the first set at 8:30. For more information, go to sidedoorjazz.com or call 860-434-0886. Scheduled to appear at The Side Door on November 29 is pianist Glenn Zaleski with bassist Dezron Douglas and drummer Craig Weinrib. The pianist just subbed this week for John Escreet in Jamie Baum's Septet and Quintet appearances in Massachusetts and Connecticut (including The Side Door) - he's also a member of a collective trio with drummer Colin Stranahan and bassist Rick Rosato whose 2nd CD has just been issued. "Limitless" (Capri Records) is an appropriate for this new recording. Don't shake your head just because you think that because there are so many piano trios in the world (probably some in the universe as well) that the music these gentlemen play can't offer you something new. Yet, listen to the excitement in this music - not only does it come from 3 gifted musicians who have a good percentage of the past few years "playing" together but also from the material that mines the Trio's myriad influences. 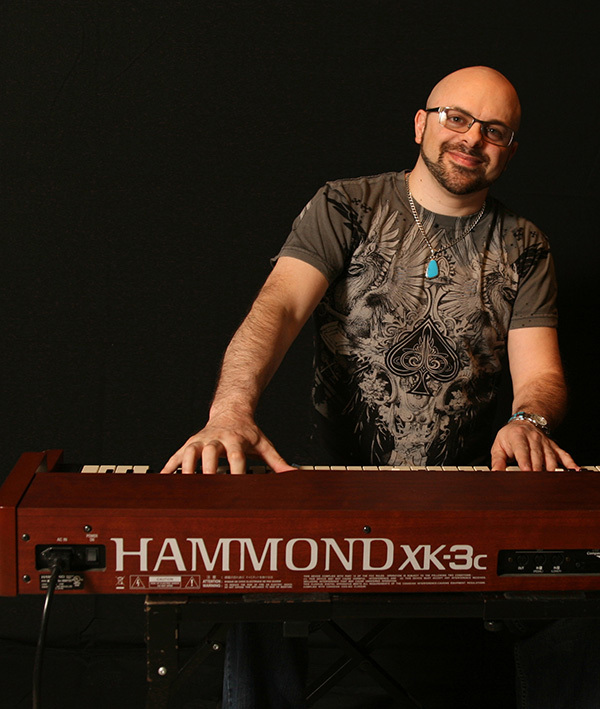 The pleasure derived from Colin Stranahan's expressive percussion, the melodic work of Rick Rosato and the rhythmical yet melodic work of Glenn Zaleski on the title track (that he composed) could certainly make one dance. The pianist, who has studied with Fred Hersch, truly understands that the piano is both orchestra and rhythm section. Also, there are hundreds, if not thousands, of covers of Thelonious Monk songs but relatively few as animated as the rendition of "Work" heard here. 3 of the 9 tracks are composed by bassist Rosato including the delightful "Rock Song" which dances, stops and starts, changes pace and keeps one off-guard all the way through. His "Migrations" opens quietly but soon Stranahan's rapid-fire snare work electrifies the proceedings. "Vio" commences with a long unaccompanied bass melody before the rest come in with a thematic line that one hear as the theme song from a 1940s movie. The pianist articulates his notes so well you can feel that he knows the words. 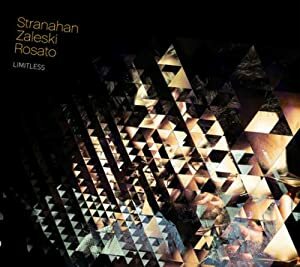 Stranahan, who is rapidly making a name as a "go-to" drummer, composed "Motian Sickness"; obviously dedicated to the late drummer/composer, the minimalist melody in the bass and piano stand in contrast to the to active drum work (the cymbal work throughout is striking - no pun intended). The melody that emerges out of the song's chords, especially close to the end of the piece, is rich with emotion. With the exception of afore-mentioned Monk piece, the remaining 4 tracks are credited to the pianist. You will not hear a prettier melody this year than the one from Zaleski's "Chorale (for Fred Hersch)" - even the bass solo shines with melodic intensity. This cut does have the feel of the Keith Jarrett Trio with Jack DeJohnette and Gary Peacock but is no imitation. The pianist also penned "Forecast", a romp that jumps from the opening note. The trio's interactions are so enjoyable, breath-taking at times. Stranahan/Zaleski/Rosato is a trio to be reckoned with. "Limitless" lives up to its name, and then some. Give this a listen - give it 2, 3 even more - you should be quite pleased. For more information, go to stranahanzaleskirosato.com. Firehouse 12's Fall Concert Series continues apace; in fact, the series picks up the pace with 7 concerts in the final 5 weeks. This Friday (November 15), the performance space/recording studio welcomes the Jamie Baum Septet for 2 shows. Ms. Baum, a fine flutist/composer/arranger whose wonderful new CD "In This Life" (Sunnyside Records) is reviewed below, brings a band, many of whom she has worked with for over a decade. Longest serving member is drummer Jeff Hirschfield who has been on every one of Ms. Baum's 5 Cds as a leader, starting in 1992 with "Undercurrents" (issued on the German Konnex label.) Next would be Douglas Yates (alto saxophone, bass clarinet) who has worked in the ensemble for over 10 years as has Chris Komer (french horn) who usually does not tour. Rounding out the Septet (on the record and in New Haven) is Amir ElSaffar (trumpet), Brad Shepik (guitar), Zach Lober (bass) and John Escreet (piano) - both ElSaffar and Escreet have been at Firehouse 12 this fall when the trumpeter appeared to spotlight his new Pi Recording, "Alchemy." The music on the new CD has a number of inspirations but none stronger than the music of the great Pakistani Quawwali singer Nusrat Fateh Ali Khan (1948-1997). In fact, the opening and closing tracks bear his name, with the final track also including an arrangement of his "Sweet Pain." What stands out is the beautiful blend of ElSaffar's trumpeter with the leader's alto flute. The melody, based on a vocal improvisation by Ali Khan is so exciting and rhythmically strong, especially in the opening selection (where it is powered by Dan Weiss's impressive tabla work. Ms. Baum also adopted a piece titled "Tana Dery Na" into "The Meeting", a ballad featuring fine ensemble work plus a strong solo from bassist Lober, the latter half of which is shared with the flute D'Amore, an instrument pitched between a C-flute and an alto flute. Another inspiration is co-producer Richie Bierach; he produced the flutist's second CD, "Sight Unheard" (GM Music), has performed in a duo setting with her and one can hear his musical influence, especially on the title track as well as the piece dedicated to him, "Richie's Lament." His "touch" is notable in the clarity of the melodies and the uncluttered arrangements. Each instrument stands out as not only "playing its role" in the music but also how Ms. Baum weaves the individual sounds together. That "weave" truly stands out on "While We Are Here", in how the "low" sounds of the acoustic bass and bass clarinet mesh with the soft trap set and piano. Yes, there is a gentle feel but also a forward motion, a flow, that engages the listener from the start. Don't overlook the work that Brad Shepik and John Escreet put into the music. The guitarist offers strong ensemble work throughout the program and can be heard wailing over the rhythm section on the opening cut as well as his creative "percussive" guitar sounds on "In A Nutshell". The pianist, whose new Whirlwind CD "Sabotage and Celebration" is a must-hear, also fits the ensemble like a glove, standing out for his supportive work and his forceful solos - my, how he dives into the funky beats of Hirschfield, Weiss and guest percussionist Samuel Torres on "Ants and Other Faithful Beings." There is not a weak song nor an incomplete arrangement anywhere on "In This Life." The manner in which Jamie Baum wraps different rhythms, tempi and melodies into pieces such as "Nusrat" and "Ants..." illustrates her deep understanding of how to weave musics of the world into the music she has developed over the past 20+ years. On top of that, her playing is often exquisite, stimulating and commanding. For more information, go to www.jamiebaum.com - to hear and to download the recording, go to sunnysidezone.com/album/in-this-life. For information about the Septet's appearance in New Haven, go to firehouse12.com. The following evening, a Quintet version of the group appears at The Side Door in Old Lyme, CT - for more information, go to thesidedoorjazz.com. This venue has got quite a schedule coming up including the Duke Robillard Trio (11/21), the Rene McLean Sextet with Gary Bartz (!) (11/23), the Glenn Zaleski Trio with bassist Dezron Douglas (11/29) and the Donny McCaslin Trio (12/05) - that's just a few of the date so clink on the link above to find out more. Sometimes, one could consider vocalist/lyricist/bandleader Fay Victor a force of nature. Over the past few years, Ms. Victor has made inroads into the creative music scene with her no-holds-barred, improvisational, approach to music. Along with bassist Ken Filiano and guitarist Anders Nilsson, she is creating music that breaks barriers while being true to Whitney Balliett's description of jazz as "the sound of surprise." "Absinthe & Vermouth" (Greene Avenue Music) is the Fay Victor Ensemble's 3rd CD and first without a drummer. Yet, who needs s trap drummer when all 3 members of the group contribute to "rhythm section", whether it's the scratching beat of Nilsson's electric guitar, Filiano's forceful strumming or how his bow bounces off the strings or Ms. Victor's snare drum-like approach to particular phrases of the lyrics. Just listen to the opening track "Big Bag." Basically, it's a list of what the singer/composer (husband Jochem van Dijk is her collaborator on every track) keeps in her travel bag but the accompanying music combines the late 60s blues feel of Jimi Hendrix with vocals that channel opera, poet/performer Jayne Cortez, Frank Zappa, Captain Beefheart and others still to be discovered. During the solo section, the guitarists roams far afield while the bassist creates a thunderstorm beneath. Yet, both musicians return to the "main theme" easily, organically, and with great panache. Her duo with Filiano on the final track "Shaded in Grey" blends playful vocals from both (sounding somewhat like Charles Mingus in the late 50s) - it's an argument that Filiano takes part in as both musician and vocalist. Ms. Victor's ballad work is often stunning, with an emotional depth that pulls the listener closer. "Crystal" is just voice and guitar; the weaving of sounds, silence, words and music seems so personal yet universal. There is a similar feel to "Seashore", the music like a calm ocean, the voice like a sift breeze creating an intimacy that is tangible and sensuous without feeling forced. There are 2 tracks - "I'm On A Mission/Paper Cup" and "The Sign At The Door" - that are both over 15 minutes and feature distinct sections. The former track comes at the listener with highly-amplified guitar (blues-rock stylings) and mighty, melodic, bass work then goes into a long, quiet, section (listen closely and you can hear Ms. Victor whispering words and percussive sounds in the background) before the FVE drops into a super-slow melody for Ms. Victor to sing sweetly about love and the issues one faces in relationships. The latter tells the story of a day in Weimar, Germany, and the lyrics relate the dichotomy of the modern city and the insanity that enveloped the townspeople during the Hitler years. That craziness enters the singer's words as she sings/speaks out "Come and get me"/Another fear lay out that there" and that phrase returns again and again as the narrator moves through the city. "Brutal air is all that is needed here/Clear" makes the song turn darker (as the music becomes more frenetic. There seems to be no clear resolution (can there be?) but the singer continues to "..walk through the town square/enjoy the warm sky down there" and seems to come to terms with her visit. Filiano's wonderfully active unaccompanied bass leads us into "Gunk", a joyous description of cleaning out the "garbage" we cart around in our psyches. Nilsson's hard-scrabble guitar work and rapid-fire rhythm lines move easily around Filiano's vigorous bass lines. The soaring vocal lines, the growling phrases, the bluesy scatting, all contribute to the joy that inhabits this track. "Absinthe & Vermouth" is filled with music that thrills those listeners who love a challenge (and might scare the devil out of purists). It's easy to hear the Fay Victor Ensemble are a trio of equals - no one steals (or hogs) the spotlight and the creative interplay speaks of years of interaction, of paying attention to each other and enjoying the challenges that these compositions pose. As an active listener, take your time and enjoy this aural roller-coaster. For more information, go to www.fayvictor.com. A reminder - Ms. Victor joins Stephen Haynes (trumpets) and Joe Morris (guitar, bass) this coming Saturday November 16 at 7 p.m. as part of the monthly "Improvisations" series at Real Art Ways, 56 Arbor Street in Hartford. A splendid time is in the offing for all! For more information, go to www.realartways.org or call 860-232-1006. Over the past 3+ decades, Marty Ehrlich has created numerous musical experiences that one returns to time and again. His Quartet with fellow reed player Stan Strickland, his duo with pianist Myra Melford, his work with the Julius Hemphill Sextet, his Dark Woods Ensemble with cellist Erik Friedlander, the Rites Quartet, and his cooperative group with trombonist Ray Anderson. 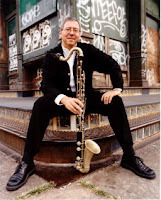 The thread running through each of the projects he has organized or still is involved in is his sweet alto saxophone sound, his strong clarinet and bass clarinet work as well as how seamlessly he mixes melody, harmony and rhythm, never skimping on any or all of those aspects of his music. On Tuesday, November 12 Mr. Ehrlich releases his most ambitious project - "A Trumpet In The Morning" (New World Records) and begins a week-long residency at The Stone, corner of Avenue C and 2nd Avenue in New York City. Over the span of 6 nights, he will perform 12 sets with 11 different ensembles (more on that below). Other highlights include "M Variations (Melody for Madeline)", a piece originally recorded by Mr. Ehrlich's Traveler's Tales Quartet and expanded several years later for the New York Composers Orchestra. Uri Caine opens the piece with an unaccompanied piano solo and the arrangement features a handsome melody for the reed section with harmonies from the brass. The pianist fashions another solo in the midst of the performance as does bassist Gress, tenor saxophonist Kolker and trumpeter Horton. "Blues for Peace" was commissioned for a high school jazz orchestra in California but don't think it's a simplistic work. Wilson lays down a solid beat and the ensemble rocks and roils above it. The CD opens and closes with "Prelude: Akgebor Translations" and "Postlude: Akgebor Translations", the newest composition. Originally written for the collaboration of the Hampshire College Jazz Improvisers Orchestra (directed by the composer) and Mt. Holyoke West African Drumming Ensemble, the inspiration for the rhythm came from Ghana and the raucous horn and reed melody could easily come from New Orleans. The solos wind in and around the drums of McPherson and percussion of Warren Smith. 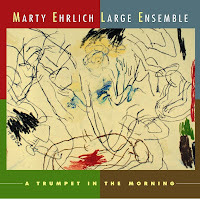 "A Trumpet In The Morning" is a delightful 76 minutes of music, all informed by Marty Ehrlich's pursuit of a musical vision that takes in sounds from all over the world and from his days in the B.A.G. (where he not only met J.D. Parran but also Julius Hemphill, Oliver Lake and Charles "Bobo" Shaw.) There is a lot to take in on the CD but take your time, savor these sounds and solos; after a short while, the joy that went into the creation of this music will make you glad to be alive. For more information, go to www.newworldrecords.org. including J.D. Parran (pictured left with his bass sax!). Saturday evening, both sets will features the Ray Anderson-Marty Ehrlich Quartet. Rounding out the group will be bassist Brad Jones (who also plays in both groups on Friday) and drummer Matt Wilson. The final 2 sets of the week (on Sunday) feature the Dark Woods Ensemble. 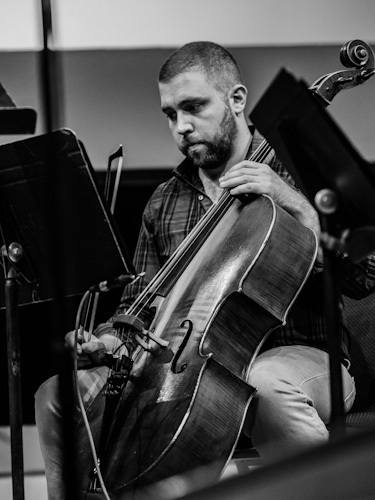 First, Ehrlich, cellist Erik Friedlander and bassist Drew Gress will play music from the 1995 CD, "Just Before the Dawn" while the second show will add guitarist Liberty Ellman to the trio to play music from "Sojourn", a 1999 recording for Tzadik. All told, it's an incredible week of music old and new. For more information, go to thestonenyc.com. This coming Sunday (11/10), I'll be broadcasting an interview I conducted with Marty Ehrlich. I have followed his career and music since the 1980s but this is the first opportunity I've had to go in-depth with him. The interview can be heard at 12noon on WLIS-AM Old Saybrook, CT, and WMRD-AM Middletown, CT. The station also streams live on www.wliswmrd.net. Finally, I will post a link on this blog to the interview next week. The Uncertainty Music Series presents a pair of duos in concert this Saturday November 9 at 8 p.m. in Never Ending Books, 810 State Street. Opening the show will be the duo of vocalists Anne Rhodes (pictured left) and Stephanie Lavon Trotter performing a series of improvs and new works. Both have extensive backgrounds working in "new" and experimental music, both have worked with Anthony Braxton and both have great range. This should be a fascinating program. 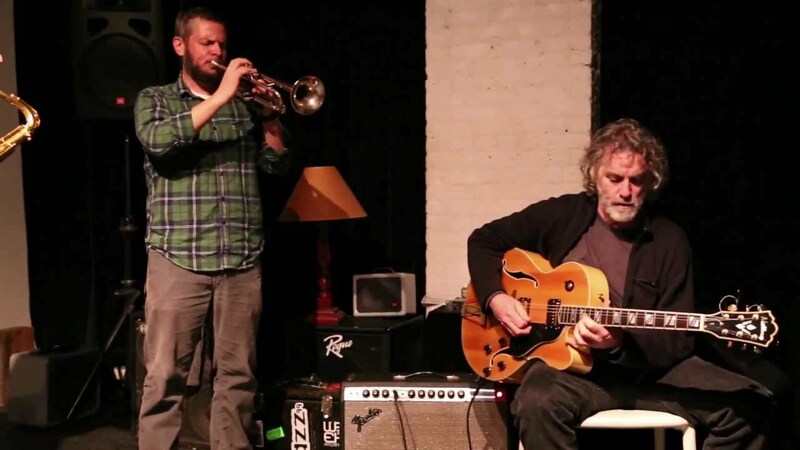 The other duo pairs guitarist Joe Morris with trumpeter Nate Wooley for a set of improvisations that run the gamut from open conversations to startling moments of melody. They have worked together for a number of years and released a CD on the Clean Feed label in 2010 titled "Tooth and Nail." Thoughtful and playful, challenging and dark, the duo will make you sit up and take notice. For more information and upcoming concerts, go to uncertaintymusic.com. Alto saxophonist and composer Michaël Attias last visited New Haven and Firehouse 12 in May of 2009. He returns this coming Friday (11/08) with a new project and Quintet. 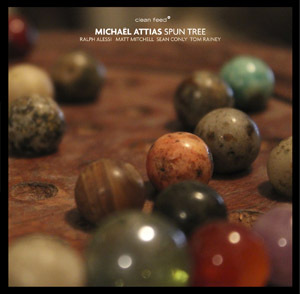 His latest Clean Feed CD is titled "Spun Tree" and features Ralph Alessi (trumpet), Sean Conly (bass), Matt Mitchell (piano) and the incomparable Tom Rainey (drums). The music Attias created for the group and recording blends jazz with world music rhythms - Rainey plays with abandon and taste throughout, locking in with bassist Conly on several tracks to truly move the music in a multitude of directions. Mitchell, who seems to everywhere at the moment, creates modernistic paintings beneath the soloists and also displays an exciting rhythmic drive. Trumpeter Alessi has a pleasing bright tone, a probing style and plays off the rhythm section with glee. The leader leaves plenty of room for the band to have its say while creating melodies that gives all a solid foundation to play with or against. His forceful playing is all the more impressive in that his tone has a softer edge. For the band's Firehouse 12 gig, Kris Davis will be in the piano chair. Her work load over the past 5 years has been quite heavy which is understandable given that she can play just about anything. She has a great knack of moving with a soloist as if in the musician's head. When she play a solo, she avoids cliche to create a statement that catches the ear and engages the mind. Michaël Attias and Spun Tree will play 2 sets - 8:30 and 10 p.m. Go to firehouse12.com for more information and to buy tickets. For more about Mr. Attias, go to www.michaelattias.com. "Tightrope" is 3 Cohens' 4th CD and 3rd for Anzic Records and, with several notable exceptions, is a true family affair. 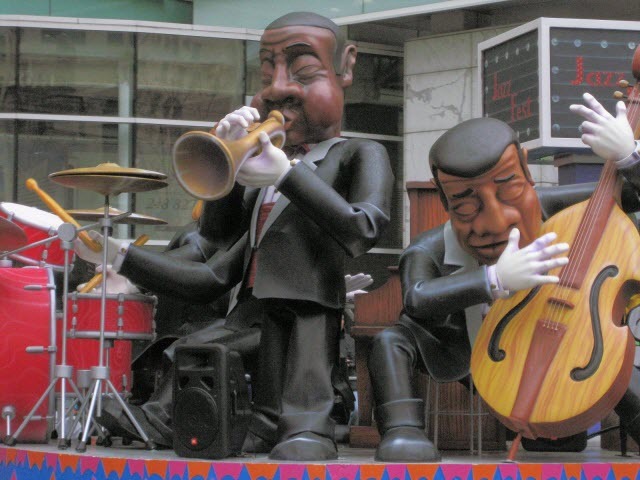 The program looks back at the siblings' influences, featuring 2 pieces from the Gerry Mulligan-Art Farmer Quartet songbook (Farmer's "Blueport" and Mulligan's "Festive Minor", a tune each from Thelonious Monk ("I Mean You"), Tadd Dameron ("Hot House") and "Estate", an Italian ballad made famous by Joao Gilberto. Pianist Fred Hersch drops by for 3 tracks (the afore-mentioned "I Mean You" and "Estate" plus a striking rendition of his piece "Song Without Words #4: Duet". The fine young drummer Johnathan Blake appears on Avishai's "Black", a raucous romp that features rousing solos from all 4 musicians. Bassist Christian McBride puts the 3 siblings in a low-down blues mood, joining them on a sweet version of Duke Ellington's "Just Squeeze Me." The CD has a number of other musical treats including a lovely solo trumpet reading of "There's No You", a tune made famous by vocalist Jo Stafford in 1944 and again in 1957 by Frank Sinatra. Avishai uses his mute to tell his tale, creating a handsome mood with dollops of notes and the right amount of silence. The trio also rearranges a traditional Yiddish tune, "Ai Li Lu Li Lu", a melody their mother sang to them as very young children. There are also 5 short improvised "Conversations", 4 of which feature all 3 and 1 that is a duet for the brothers. And there is more but you explore this "Tightrope" on your own and with close friends who love music that swings, sings, takes chances and is, often, great fun. Yuval, Anat and Avishai - 3 Cohens - each displays great maturity and understanding of the intricacies of ensemble playing plus are all fine soloists. No family feud here, just a delightful hour of sibling teamwork. For more information, go to www.3cohen.com. Drummer and composer Harris Eisenstadt is certainly one prolific creative person. He leads the Canada Day quintet (expanded to a octet for a 2012 482 Music CD), the September Trio (with Angelica Sanchez and Ellery Eskelin) and now this Quartet that has recorded "Golden State" (Songlines Recordings). Let's not forget he also co-leads the Convergence Quartet and is working in ensembles led by Francois Houle, Sean Moran, Jason Mears, Earl Howard and Mike McGinnis. One might conjecture that "Golden State" came into existence so that Eisenstadt could see his wife Sara Schoenbeck on a more regular basis. In actuality, this quartet formed during the drummer's 2012 residency at CalArts - Schoenbeck, who plays bassoon, joins him as does flutist Nicole Mitchell and bassist Mark Dresser in an all-original program that, at turns, swings, floats, dances, shimmers, quakes and burns with an irresistible creative fire. Ms. Mitchell has a clear sound that blends so well with the lower, harder, bassoon tone. Yet, when one listens to a piece such as "Sandy", both musician have such warmth in their sound as well as great emotion. Add to that Dresser's strong bow work and Eisenstadt's conversational drum work and the music is inspirational. Eisenstadt is one of the more "melodic" drummers one hears these days - on the opening track, "What Is a Straw Horse, Anyways? ", it is fun to notice how he accentuates what his partners are playing. In essence, he is the "counterpoint" in the piece. "Flabbergasted by the Unconventional" opens with a fiery unaccompanied bassoon melody that opens to a bowed bass section with Ms. Mitchell and Ms. Schoenbeck playing the counterpoint over Eisenstadt's active yet quiet drum work. When the bassist begins to pluck, the beat changes, gets somewhat more forceful as the bassoon and flute carry on a conversation. "Golden State" certainly refers to California but one might be led to believe the title refers to the enjoyment this quartet had in creating this "chamber-jazz" program that Harris Eisenstadt composed for them. This is music that breathes and not just because there are 2 wind instruments in the mix. One feels refreshed by this sonic experience. For more information, go to www.harriseisenstadt.com/bands/goldenstate/. On November 12, 2 fascinating new CDs will be released. 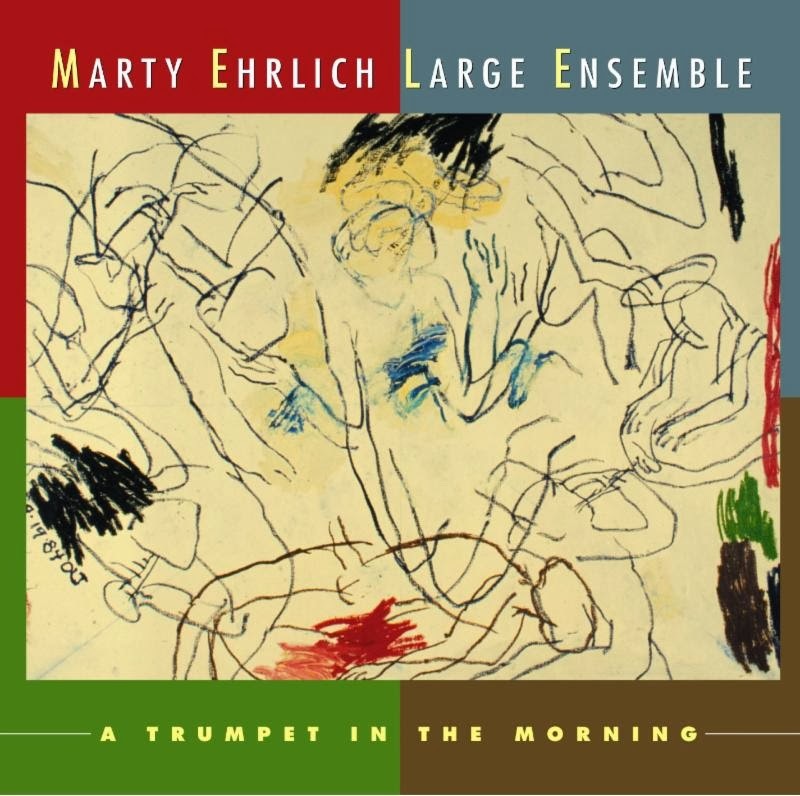 Saxophonist/clarinetist/composer Marty Ehrlich presents "A Trumpet In The Morning" (New World Records), a program created for large ensembles that builds on his past and shows his continuing excellence as a musician and, now, his brilliant arrangements. Also on that day, cornetist/composer/arranger Taylor Ho Bynum releases "Navigation: (Possibility Abstracts X-XIII" (Firehouse 12 Records), a 4-album set that combines composition with improvisation in ways that not only show the influences of the late Bill Dixon, Anthony Braxton and Wadada Leo Smith has had on the composer. In Bynum's words, the piece "is broken into six movements, each with a markedly different idiomatic identity, that can be re-ordered by the band members during each performance. This approach is meant to maximize the freedom, choice, and agency of the musicians while still maintaining a strong compositional structure. The musicians are encouraged to take their time (and take risks) in exploring each section, embracing both silence and chaos in every performance." "Abstracts X & XI" are being issued as a limited edition double-LP and features Bynum's Sextet of Mary Halvorson (electric guitar), Jim Hobbs (alto saxophone), Bill Lowe (bass trombone, tuba), Ken Filiano (acoustic bass), and Tomas Fujiwara (drums, vibraphone). Recorded live in the performance space of Firehouse 12 in New Haven, CT, on Friday December 7, 2012, the music goes in myriad directions, with elements of "free" music, blues, swing, and much more. 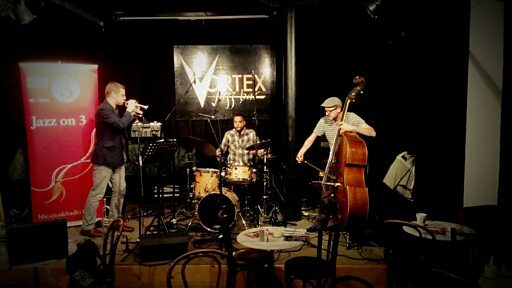 "Abstractions XII & XIII" are being released as a double-CD - recorded the very next day in the same space (this time, in the "recording studio" space), drummer/vibraphonist Chad Taylor makes the ensemble a 7-Tette. Both the LP and CD sets come with a complimentary download coupon for the entire set so the listener has the ability to mix and match the sounds. Taylor Ho Bynum brings the Sextet to Real Art Ways, 56 Arbor Street in Hartford on Thursday November 7, the first night of 4 consecutive gigs for the group. On subsequent nights, the ensemble plays The Lilypad in Cambridge, MA, The Jazz Gallery in New York City and Bohemian Caverns in Washington, D.C. - for more information, go to taylorhobynum.com/calendar. On Saturday November 16, the "Improvisations" series continues at RAW. This month, series curators Stephen Haynes (trumpet) and Joe Morris (guitar, bass) welcome Fay Victor, one of the finer vocalist/improvisors to emerge on the creative music scene in the last decade. If you have never seen her perform live, she is joy incarnate. She scats, she wails, coos, squalls, caresses, plays with words as if writing a play on stage, and does so with a twinkle in her eye. One can hear influences ranging from Nina Simone to Frank Zappa to Bill Dixon to Jimi Hendrix in her music - it should be a gas to see and hear how she interacts with Messrs. Haynes and Morris. Ms. Victor has a new CD being released this coming Tuesday (11/05) - "Absinthe & Vermouth" features her ensemble of Ken Filiano (bass, effects) and Anders Nilsson (electric guitar, effects), their 4th CD together and first without a drummer. The interaction of the FVEnsemble is intuitive, challenging, joyous, raucous, "cool" without being chilly and worth listening to with both ears open. I'll have a review of the CD in a week or so but, to find out more, go to www.fayvictor.com to find out more. You can buy tickets to both these events and find out more about what Real Art Ways is doing by going to www.realartways.org.